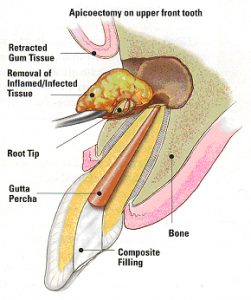 The most common endodontic surgical procedure is called an apicoectomy or root-end resection. When inflammation or infection persists in the bony area around the end of your tooth after endodontic treatment, your endodontist may perform an apicoectomy. In this procedure, the endodontist opens the gum tissue near the tooth to expose the underlying bone, and the infected tissue is removed. The very end of the root is also removed, and a small filling may be placed to seal the root canal. Local anesthetics make the procedure comfortable, and most patients return to their normal activities the next day. You are probably reading this site because your endodontist believes Endodontic Surgery may help save your tooth. To understand Endodontic Surgery, it helps first to know something about the nonsurgical endodontic procedure, or “root canal.” A root canal is necessary when the soft inner tissue, or “pulp,” of the tooth becomes inflamed or infected. This may happen as a result of deep decay, repeated dental procedures on the tooth, or a blow to the tooth. Endodontic treatment removes the damaged pulp. Then the tooth’s canal are cleaned and filled to help preserve the tooth. All dentist received training in endodontic treatment in dental school. However, because endodontic surgery can be more challenging than providing nonsurgical treatment, many dentists refer patients needing surgery to endodontists. Endodontists are dentists with at least two additional years of advanced education and training in root canal techniques and procedures. In addition to treating routine cases, they are experts in performing complicated procedures including surgery. They often treat difficult cases – such as teeth with unusual or complex root structure or small, narrow canals. This special training and experience can be very valuable when endodontic surgery is necessary. Often, the only alternative to surgery is extraction of the tooth. The extracted tooth must then be replaced with an implant, bridge, or removable partial denture to restore chewing function and to prevent adjacent teeth from shifting. Because these alternatives require surgery or dental procedure on adjacent healthy teeth, endodontic surgery is usually the most cost-effective option for maintaining your oral health. No matter how effective modern tooth replacements are-and they can be very effective-nothing is as good as a natural tooth. You’ve already made an investment in saving your tooth. The pay-off for choosing endodontic surgery could be a healthy, functioning natural tooth for the rest of your life. Surgery may be used in diagnosis. If you have persistent symptoms but mo problems appear on your x-ray, your tooth may have a tiny fracture or canal that could not be detected during nonsurgical treatment. In such a case, surgery allows your endodontist to examine the root of your tooth, find the problem, and provide treatment. Usually, a tooth that has undergone a root canal can last the rest of your life and never need further endodontic treatment. However, in a few cases, a tooth may fail to heal. The tooth may become painful o diseased months or even years after successful treatment. If this is true for you, surgery may help save your tooth. Other surgeries endodontists might perform include dividing a tooth in half, repairing an injured root, or even removing an injured root, or even removing one or more roots. Your endodontist will be happy to discuss the specific type of surgery your tooth requires. In very complex cases, a procedure called intentional replantation may be performed. In this procedure, a tooth is extracted, treated with an endodontic procedure while it is out of mouth, and then replaced in its socket. These procedures are designed to help save your tooth. Local anesthetics make the procedure comfortable. Of course, you may feel some discomfort or experience slight swelling while the incision heals. This is normally for any surgical procedure. Your endodontist will recommend appropriate pain meditation to alleviate your discomfort. Your dentist or endodontist is suggesting endodontic surgery because he or she believes it is the best option for you. Of course, there are no guarantees with any surgical procedure. Your endodontist will discuss your chances for success so that you can make an informal decision.